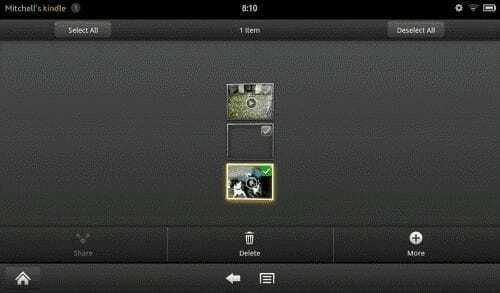 Learn how to delete music and videos from the Amazon Kindle Fire and free up some space in memory. From the Home screen, tap “Music“. Select “Device” at the top of the screen. You can tap and hold any albums you wish to delete until a menu appears, then select “Remove album from device“. If you wish to delete an individual song, select the album or go to “Songs“, tap and hold the song until a menu appears, then select “Remove song from device“. If you want to delete music that appears under the Cloud selection, you’ll have to remove the music tracks using the Amazon Cloud Player website. There you can click/tap the arrow when you mouse over any song and select Delete. To remove multiple songs, use the check boxes to the left of each track, then select the Delete button toward the upper-right part of the screen. Select “Apps” > “Local” > “Gallery“. Tap and hold a video you wish to delete. The Delete option will appear at the bottom of the screen. Check any other videos you want to remove, then tap “Delete“. Select “Video” from the home page. Select “Library” at the upper-right corner. Tap and hold the video you wish to remove, then select “View Season Details“. Downloaded episodes will be listed and have an arrow and check-mark icon. Tap and hold the video you wish to delete until a menu appears. Visit Amazon to manage your videos. Select the video you wish to delete. The “Delete” link will be available on the right side. Confirm your selection on the dialog box that appears. If you ever decide you want the movie or TV show you deleted, you can access your Deleted Items to restore it. How do I remove files from Fire HD8 SD card? I used ES Explorer but it failed. Please advise. I want Amazon music on my Echo. Instead of has gone on my Fire tablet and now I don’t know how to delete it. The music is playing all the time on my tablet and I can’t stop it. NO- I Rewrote the offline music to my SD card, but the Kindle now rejects the new order and declares some songs missing! I should be able to clear the entire Kindle internal list, install a fresh card and have the device re-create all the songs. This is ridiculous. I am trying to remove multiple songs from my Kindle Fire HD. They are loaded directly on the tablet, not on the cloud. How can I delete them without doing it one song at a time? This did not work for me. Followed the instructions to the letter but the ,video is still on the Fire tablet. I can remove it from the carousel on the Home screen but still available in the Video screen. Restarted it, same thing. What the heck, Why is it so difficult? Thank you in advance for any assistance. Wanted to delete videos from my kindle, followed your directions and had no problems. Thanks! Thank you! Wish Kindle made it easier to remove movies by having that option at the start instead of having to go to the Amazon account.